The growth of mobile devices and smartcard technology is increasingly playing a role in the development of an organization’s security strategy. 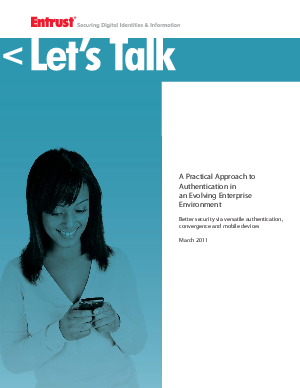 Mobile devices enable organizations to leverage a very flexible, convenient and low-cost method for authentication. Organizations also can begin leveraging smartcard technology to consolidate two security environments: physical and logical access. Once the responsibility of two distinct organizations within a company, combining physical and logical access solutions provides these organizations consolidated management, improved ROI and a total security view. By leveraging the platform approach, businesses can broaden their security deployment, provide flexibility for employees and partners, while achieving operating efficiencies. Whether it’s a smartcard for physical and logical access, soft tokens on a mobile device, or a unique grid card for strong authentication to a VPN, organizations can consolidate all authentication processes with a single, proven solution.